The LapTraveler RWHD Series Mobile Desk is a heavy duty mobile desk designed to create an ergonomic workstation in a vehicle. Made of sturdy ABS molded plastic, the Laptop Desk offers forward and backward tilt, as well as side to side tilt. The platform measures 13" X 14" and can support computers weighing up to 30 lbs. Two types of base are available. The No-Drill base attaches to the vehicle without any tools required; the Drill base is bolted permanently to the vehicle. Both versions of the Laptop Desk come with three telescoping tubes to provide maximum adjustability. Note: Please call to confirm price and availability on this clearance item. The Light Duty Mobile Laptop Desk by Interactive Products Corporation is a highly adjustable laptop stand designed to create an ergonomic workstation in a vehicle. 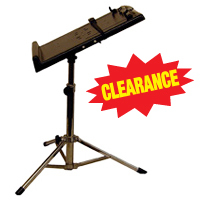 Made of black ABS plastic, the stand can support computers up to 30 lbs, and works in all vehicles that have front-seat bolts (i.e. not hooks). 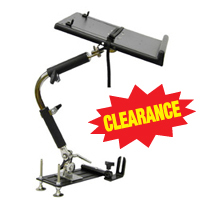 The stand does not interfere with airbags and can be removed quickly and easily. Two bases are available: one that can be permanently attached with screws (requires drilling into the base of the vehicle seat), and one that attaches using a clamp. The ultimate laptop tripod for standing applications on the market. 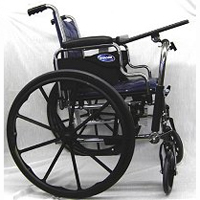 Incredible quality, robust design with circular legs and soft rubber grip feet to prevent unintended movement. The telescoping tube stop increases safety and prevents the user from accidentally pulling out the center tube. Heavy-duty, yet portable tripod stand. The Ultimate Tripod is rated to hold 150 lbs (68.2 kg). Ultimate Tripods are made with only the finest aluminum tubing with a durable black or silver finish. The die-cast metal clamp provides maximum strength and durability. The closure lever is preset to the proper tension for easy set-up. The rubber footcaps won't fall off! The HelpMate Wheelchair Desk provides a sturdy computing surface with many positioning features. 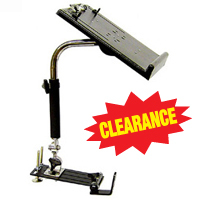 It can also be used as a desk (attaches to the wheelchair arm). A light, portable stand for the go anywhere user. Perfect for stenographers, boardrooms, airports, etc. 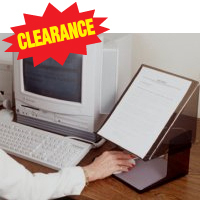 Durable chrome plated finish holds laptop computers or stenograph machines. 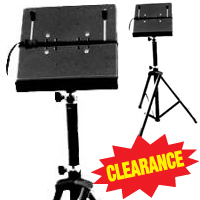 CP-JR - height adjusts from 15" to 26.5"
CP-JR-PLUS - height adjusts from 20" to 31.2"
Platform Dimensions: 13" x 13" x 1"
Folds up for easy transport - collapsed tripod dimensions: CP-JR - 14.75" X 3", CP-JR-PLUS - 20" x 3"